Thursday night was a local game, not far from my home. My wife wasn’t feeling up for sitting in the rain and I don’t blame her. Of the options, there were a game in Euclid, a Niles McKinley-Howland game, and a game at Stambaugh Stadium at Youngstown State between Cardinal Mooney and Warren Harding. Given the short drive, I opted for the game at YSU. I’d seen games there before, but never a high school contest. Despite the short drive, I was running late and arrived after the nearby parking lots were full. With the longer walk, I missed the first five or six minutes of the first quarter. The game itself was decent, but the rain put a damper on it. Warren Harding couldn’t keep up with Mooney, losing 27-19. During the game, I found out that Jefferson (near Lake Erie) was hosting Youngstown Liberty as well. Another place I’d yet to see a game. Though the rain would’ve been worse. I probably would’ve chosen that game had the schedule been publicized. Friday was in Greenville at Thiel College for the Greenville-Reynolds rivalry game. Despite a down season for the Reynolds Raiders, they made a game of it and despite more rain, made it an entertaining contest. Greenville scored to win it, 21-18. Finally, on Saturday, we were mostly free of the rain. The plans were for a trip to East Cleveland and venerable Shaw Stadium for an early contest between the Shaw Cardinals and Bedford. It was projected to be a close game, but was anything but. A very small crowd and a one-sided game really put a damper on my first ever visit to Shaw Stadium. For those unaware, Shaw Stadium can stake claim as one of the few stadiums to ever host an NFL team. The old Cleveland Rams called the stadium home in 1938. It’s an ancient, oversized relic for the contests it hosts today. With an internal walkway and berths to reach the seating area, it is impressive, if slowing falling apart. Bedford won easily, 41-0 before a small crowd numbering in the hundreds. After the game, it was a drive up I-90 toward Geneva and their impressive sports complex known as the SPIRE Institute. Having seen the Geneva-Madison rivalry game here before, I got to see it from the homeside this time. Ashtabula St. John has been playing home games here as well, and this time a Saturday night contest against road-weary Shenandoah from Sarahsville, OH making the long trek. As with the early game, this one wasn’t much of a game. The Shenandoah Zeps won easily, 42-12. The Zeps, interestingly enough, are named for Zepellins, one of which famously crashed not far from where the high school was built. Again, though, we didn’t escape the rain as a light mist fell through much of the second half. With the lack of nearby Thursday games, we settled on an old standby, the Pittsburgh City League who were hosting Carrick and Perry at surprisingly picturesque Cupples Stadium. The biggest complaint about the venue is the lack of parking. The small crowds, though, make it acceptable as we got a spot right near the stadium shortly before the game. Also, the big positive, is the $3 admission price is the cheapest you’ll find almost anywhere. The game, though, was all Perry, winning 29-6. For Friday and Saturday it was an overnight trip for my wife’s birthday. For the night, we stayed at the “Caboose Motel” in Titusville, Pennsylvania. The motel, located next to the Oil Creek & Titusville Railroad Station is 21 caboose cars converted into individual hotel rooms. It’s quite interesting and was a hit with my wife when I told her where we’d be staying as a surprise. The game we were attending to coincide with this, was the Greenville-Titusville game at noteworthy Carter Field in Titusville. The stadium, with it’s aging rock walls surrounding the field and covered seats to the north endzone was the high school playing field of one John Heisman, who grew up in the area. Another unique fact is the northwest corner of the endzone curls upward to meet the stands. The game, itself, was all Greenville as the winless Titusville Rockets were helpless until backups were being subbed in regularly. Greenville won, 35-12. After a night at the hotel, it was an early morning drive east to the Allegheny River and along its banks from Tionesta through Tideoute and onward toward Warren. We followed route 6 east, a road I’ve traveled many times now and one of my favorite Pennsylvania routes to follow through the mountaina areas. 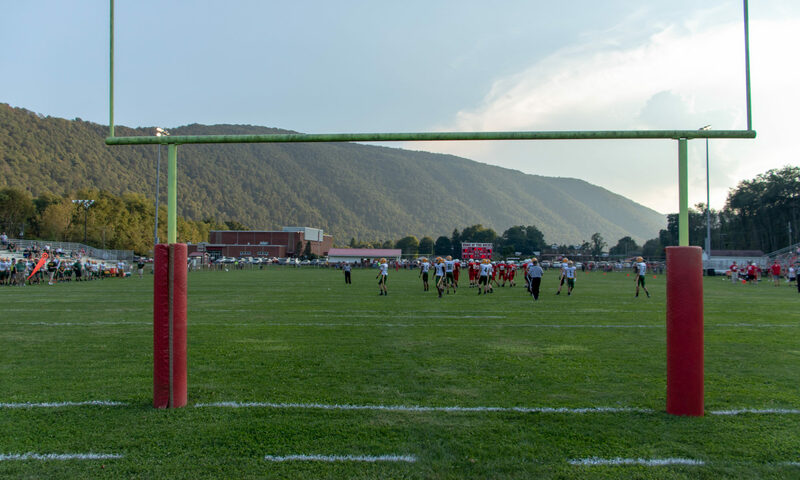 Stopping on the outskirts of town, our first game was Sheffield v. Otto-Eldred at scenic Wolverine Mountain. The game, as the others this weekend, wasn’t destined to be competitive. However, Sheffield, winless, was able to make a game against Otto-Eldred, the Terrors, who were also winless. With a decent crowd on what was expected to be one of the last good Saturdays of the season, the Terrors won, 35-20. After the game it was a short drive toward Kane and a stop at the Texas Hot Lunch, a must stop restaurant along Route 6. The food was good, but the service was slow for the time of day. It was then further southeast to St. Mary’s with a detour courtesy of a bridge collapse just north of Ridgway on US219. We took a sidetrip to see where Ridgway plays, as well as seeing where Johnsonburg had played previous to their co-op deal with Ridgway. Such a shame Johnsonburg doesn’t play as their own team. Such a great venue tucked into a small corner of town. 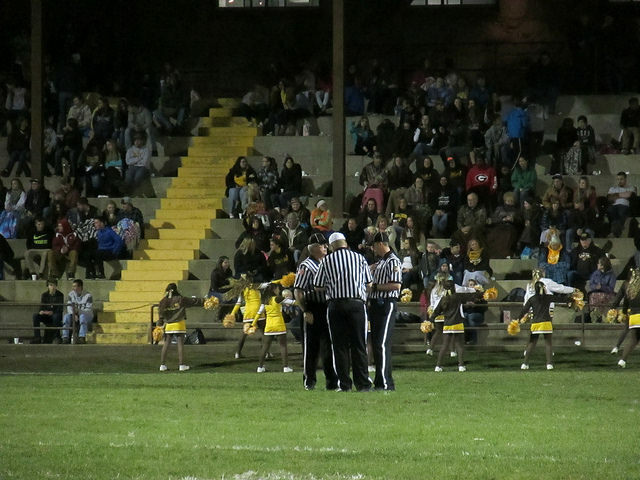 As for the night game, it was between two undefeated teams: Elk County Catholic and Kane. As ECC had been finding creative ways to win all years, they finally met their match and were shutout a cold, blustery evening, 26-0. After the game, it was the long two-plus hour drive home. An uneviable drive, too. Boring, long, and in the driving rain. The last week of the Ohio season started with a surprise Thursday affair. The original plan was to travel to St. Clairsville for the St.Clairsville-Steubenville contest. The lack of seating, and the absurd time we’d have to get there to get a decent seat was a deal-breaker. Plus, being that cramped with a pregnant wife sitting next to you wasn’t really something I wanted to experience, nor did she. So, we had planned on Cupples Stadium hosting a PCL game. And then, as if by sheer fate, Conotton Valley’s final regular season home game, who now play under the lights, was bumped up a day to Thursday at 6:30pm. Why? I’m not sure. But, as Rocket Stadium in rural Bowerston was one of my favorite places to see a game it immediately became our destination. The Rockets weren’t that good, having lost 38-7 earlier this year to Bishop Donahue at a game I attended in Moundsville. This time, they got to host Bishop Rosecrans, a team I saw years ago in Bridgeport, Ohio. As with most games Conotton Valley played recently, they lost rather handedly, 52-19. They kept it close for a while, but the Bishops were just too much. On Friday, it was a trip to Greenville for their home finale, and region finale, against Sharon. With a win, Sharon would win Region 3. With a loss, Hickory would win the region and Greenville would come in second. Andrew Tomko, QB of the Sharon Tigers, lived up to his billing, and Greenville just couldn’t keep up despite attempting to contain him defensively. Sharon won, 33-21. For Saturday, it was another trip to the Cleveland area, the second of the year. Euclid had been playing Thursday and Saturday games this year for the same reason Cleveland Heights had done in the past. Their head coach had a son playing for another team, and was trying to schedule as many games for ‘off nights’ to see his son play. After taking over as head coach for Euclid, the same scheduling formula was used. I had missed the other games, however. A Thursday night against Brunswick and an afternoon contest against Solon meant my last chance was the last week of the regular season. Euclid’s Sparky DiBiasio Stadium is a large and imposing stadium. Consisting of three parts, the center steel structure is most impressive. The two smaller wood-slat structures to both sides isn’t and barely used by anyone as the stadium now holds so few fans, similar to Shaw. With plenty of room, the small crowd for Senior Night could spread out. For the game itself, Euclid looked like they would run away with it but Shaker Heights at least made it interesting, losing 36-18. After that, it was a drive down to Bedford’s Bearcat Stadium for a private school contest between undefeated Cleveland Benedictine and Akron Archbishop Hoban. Both teams came into the contest with the #1 seed secured in their respective regions and some fans contended that ‘staying healthy’ was more important than winning. Despite only giving up 10 or more points once all year, Hoban was abused by Benedictine repeatedly, losing 35-14. The position may have been worthy, as the week before their potential playoff rematch, Benedictine lost to Toledo Central Catholic. With the WPIAL season over, it was time for Consolation Games. With not many options most years, it was surprising to see only one game scheduled at all. That was for Wednesday night in Canonsburg between the homestanding Canon-McMillan Big Macs and the visiting Shaler Titans. I had been at this stadium once before, years ago, with an odd situation. As it was a ‘date’ with my first wife. Happy to have a new memory with my wife, and future mother of my child, we attended a rather sparse game between two teams that failed to make the playoffs. Canon McMillan Stadium is nice, and with the new turf has great aesthetics. The stands, however, are so small it’s amazing to think a 4A District Semifinal was held at the venue in 2004. Just impossibly cramped. In this contest, the homeside pulled away after Shaler seemed poised for an upset, winning 48-14. Now, had I known in advance, we probably wouldn’t have driven to New York for two games. Quaker Valley was set to host South Allegheny in Leetsdale on Thursday night. The caveat was that, though it was considered a ‘varsity’ contest it was for non-seniors only. Even with that stipulation of a consolation game (the only other game than the Wednesday night contest I attended), I may have attended. Instead, my wife and I were headed to Ralph Wilson Stadium for the first day of NYSPHSAA Section 6 Championships. With the intent on being home for the Greenville game on Friday, we were only attending for one day, the Class B and Class A finals. The games moved up a day, again, because the Bills were set to play on Sunday. Both games were good contests, as Cheektowaga beat Buffalo Burgard, 25-22 in Class B. And, for the nightcap, South Park, of Buffalo, beat West Seneca East, 54-30 in a high-flying affair that seemed destined to score more before WSE faultered toward the end. After the long drive home, it was a short day about the house and a trip back north to Sharpsville for their game with Greenville. A stop for pre-game dinner with my mother in Hermitage, and it was on to one of the few Mercer County venues I’d yet to attend a game at. Now, Lakeview in Stoneboro and Slippery Rock’s home field remain the lone holdouts. McCracken Field in Sharpsville is picturesque and worthy of the good things said about it. The parking, however, is lacking. Nestled between several narrow streets, parking is difficult and despite arriving quite early, had to park quite a walk away. Part of that was not knowing which would be the fastest ticket window to get to. Having both already locked up their respective Region slots for the playoffs, this contest was a primer, but was still important for both squads. Sharpsville going for an undefeated season, Greenville was looking for a bounce-back from their Sharon loss. Sharpsville, though, just kept holding Greenville’s running game down, and the passing game wasn’t getting much going aside from a few ‘broken plays’ that went for big yards or touchdowns. Sharpsville won, surprisingly easy, 34-13. For Saturday, the original plan was the Pittsburgh City League championship at Cupples Stadium and then follow it with an Ohio Valley OHSAA playoff game at 7pm. The PCL seemed determined to mess with me, as they moved the start time from their usual 12/1pm and started it at 3pm. I had already set myself for the Lisbon-Brookfield night game, and had to search for something else. Luckily, Linsly School in Wheeling, which is not an WVSSAC member, was hosting Magnolia at 1pm. So, it was on to Wheeling and a venue I had been to several times in the past. Magnolia came in undefeated, and ranked #1 in their classification in the Mountaineer State. Linsly was limping towards the close of their season. Magnolia had some miscues, but Linsly just could not stop the outside running, and Magnolia wound up with little trouble dispatching the Cadets, 34-14. After the game, it was a drive north along the river to the small town of Lisbon off US30. I had been through this town many times, and had seen their highlights on Youngstown area television stations in the past. Their blue/white alternating fences that surround the venue are just distinctively Lisbon. Their school, however, eluded me. When I first was looking for a game, there were three in the area. Steubenville-Indian Creek at Harding Stadium in Steubenville, Columbiana-Cuyahoga Heights in Columbiana and Lisbon David Anderson-Brookfield in Lisbon. Now, I had known for years a school, in OHSAA parlance, called Lisbon Beaver, which was a rural school. And regularly saw “Lisbon” according to the local news. And I had seen, through OHSAA standings, “Lisbon David Anderson”, and had mistakenly thought they were another rural school saddled with the Lisbon zip code. It was when I searched WHERE the school was, I realized they, like Massillon Washington or Ellwood City Lincoln, simply neglected their given name when it comes to their sports teams. Many schools do this, but I find it oddly irritating. Still, whether I was watching Lisbon or David Anderson or Lisbon David Anderson, I had our night game picked out and were situated comfortably in War Memorial Stadium for the contest between the Lisbon Blue Devils and Brookfield Warriors. The one positive of the venue was close parking and $3 Arby’s Roast Beef Sandwiches at the concession stand. I originally liked Lisbon as the favorite, but Brookfield came out on fire, connecting on a 54-yard pass for touchdown early. Then, after Lisbon scored to cut the lead to 21-14, Brookfield connected on a 41-yard touchdown pass to demoralize them just before halftime. The second half was more of the same as Lisbon just couldn’t hold after closing to a one-score game. Brookfield won, 39-28. This was ‘our big trip’ of the early part of the season. Foregoing a long weekend in New York the previous week or, initially, a trip further out and about, we had a weekend planned for Iowa. The Hawkeye State may not be the tourist draw for some, but for a high school football fan, they have one of the best setups for those wanting to attend multiple games. For forty years, they’ve held their state championships at the UNI-Dome in Cedar Falls. Since the mid-90s, they’ve also hosted their state semifinals, all of them, at the UNI-Dome. It’s a similar setup to Minnesota who, prior to the demoliton of the old Metrodome while they build the new Vikings Stadium, also played all semifinal and final games in one location. With four games scheduled each day for Thursday, Friday and Saturday, we had quite a weekend. Leaving on Tuesday, we drove to Moline, Illinois for our first night’s stop. On the way, we had lunch near Fremont, Indiana and dinner at a Culver’s. If you’ve never been to one, you have to stop and get a ButterBurger and some Frozen Custard. They are to the midwest what In-n-Out are to California or Whataburger is to Texas. They are good. After waking up Wednesday, we took a slighty ‘scenic’ route through Iowa. Or, as scenic as you can make it. Corn only can look interesting for so long. However, there was a stretch of U.S. 30 I hadn’t driven on between Cedar Rapids and US61, and I was determined to see what was there. In the small town of Clarence, we stopped for lunch at the Mill Creek Cafe. A little relic still in business along the main strip through town. Keeping true lunch hours, they were only open until 2pm. Their chop steak was good, as was their pie. Their prices are very cheap for what you get. After Cedar Rapids, it was north on I-380 towards the Waterloo-Cedar Falls area. With a short stop in the town of Gilberville to see Don Bosco’s home field, who were playing in the first 8-Man semifinal on Thursday. A small town, the private school was ‘the town’s school’. Their purpose-built 8-man stadium sat on the far southeast end of town and were going through their last practice when we stopped by. Just a few minutes north, we were in Cedar Falls and checked into our hotel just east of the University area. After hanging out for a bit, we decided to head out for dinner, and given the area, get Culver’s once again (it’s that good). We were met with black skies and the occasional lightning flash. It wasn’t until we started driving south toward US20 where the shopping areas of Walmart and Target concentrate a lot of resturants that we were deluged with rain. Given we hadn’t updated our clocks, the black sky was a little premature and a horrible storm was pushing through. My wife got the Tornado Warning notification first, but as I we turned into the Walmart parking lot, the tornado sirens in town started going off. So, we turned to the first business we could find, the McDonalds and ran in just as they were locking the doors. The suspected funnel was headed toward Gilbertville, and had only been spotted on radar, nothing ever confirmed. However, it was interesting to be stuck in Iowa in November in a Tornado Warning. I’ve been in lots of warnings around the country. I’ve seen a tornado in Yukon, Oklahoma that took out the roof of a Target (which I was now across the street from another one). Luckily, the front passed and the skies began to clear and show a bit of fading blue sky. After leaving the McDonalds, we headed back across the street to the Target parking lot and the Culvers. The thing with Iowa is that I’ve yet to see a bad game at the UNI-Dome. Be it the three championship games last year, or the 12 semifinal games this year, the biggest margin of victory was 28 in this year’s Norwalk v. Sergeant Bluff-Luton game (35-7). Of the three games we saw last year, Newell-Fonda, Pella, and Gladbrook-Reinbeck were repeats. In 8-man, Don Bosco won easily, 30-7 over aforementioned Newell-Fonda and Macus-Meriden-Cleghorn defeated Glidden-Ralston (that’s a mouthful), 35-21. Because of the switch from 8-man to 11-man, the games started earlier on Thursday, which created ‘two sessions’ the first day. Each session requires its own $10 ticket. However, it did let us out and about town, and we stopped at a place not far from the stadium called HuHot Mongolian Grill, which was well worth it for all you can eat made as you want food. After that, it was a brief stop at the hotel and then back to the stadium for the second session, 3A games. The parking attendance accepted our original parking pass ($5) for the second session. The first game wasn’t that exciting, as Norwalk won 35-7 as mentioned. And then Pella defeated West Delaware, 45-26. For the next day, we got a slightly later start time with more evenly spaced games at 10am, 1pm, 4pm, and 7pm. The parking attendant, again, accepted our original parking pass which saved us some money again. The first games were Class A and the night games were Class 4A. Gladbrook-Reinbeck took their game with Denver to overtime, before winning via field goal, 19-16. This, unfortunately, pushed back the rest of the slate and we never got back on schedule. The second game, also, did no favors for time, despite being a great game. Mount Ayr and Akron-Westfield stayed neck and neck throughout. It was 7-7 after 1, 14-14 at the half, and 21-21 after 3. In the fourth, it looked like more of the same. Scoring on the first play, Akron-Westfield took a 28-21 lead. Mount Ayr answered 1:31 later, to make it 28-28. With just over 3 minutes left, Mount Ayr scored on a 29-yard pass play on 4th down and goal situation to take a 35-28 lead. Akron-Westfield moved quickly, though, and scored a 19-yard TD pass with 1:16 left to make it 35-34. Putting their playoff lives in their hands, they went for two, and converted. They held on to win, 36-35. Running very late, the Bettendorf-Cedar Rapids Kennedy game was expected to be another good contest but was a let down after those two finishes. Bettendorf, I found out, was considered a ‘dirty team’ but a lot of people. They also were rather successful. Kennedy, though, beat them easily thanks to a myriad of mistakes, 31-14. The final contest was a matchup between two schools just three miles apart: West Des Moines Dowling Catholic and West Des Moines Valley. Traveling two hours each, the crowd was impressive given the circumstances. Dowling Catholic, though, wasn’t troubled much, dispatching Valley, 24-6. With the last game ending after 11pm local time, it was a quick shot to the hotel and then checking out in the morning before heading back to the stadium. With UNI hosting a basketball game next door, parking was disjointed. Only basketball guests with parking passes could park near the stadium, which meant a long walk, or as they graciously stated, golf carts could be used to drive you to the doors. Which was a nice idea for my pregant wife when they wouldn’t let me drop her off. However, after over ten minutes of watching for a golf cart, we just started walking and flagged one down. The driver seemed destined to ferry guests over, one at a time, rather than waiting until his cart was full of passengers. Had we waited, the first game may have been over by the time he found us. So, not exactly enamored with that plan. Anyways, we were in for the final day of games. On Saturday, it was 1A and 2A games. I mentioned Class A before, and I’ll get to that. The early games were public v. private, as Iowa City Regina played Dike-New Hartford and the second game was Hull Western Christian v. Van Meter. Both private schools pulled out wins, though Western needing a fourth quarter four-and-goal 1 yard touchdown run to take the lead and eventual victory, 21-17. For the late games, things were moving smoothly. The game I really wanted to see all weekend was Spirit Lake and North Fayette Valley. Just last year, my wife and I, while driving to Texas, detoured through Iowa to visit some counties I had yet to clinch in the state. That trip took us through West Union (home of North Fayette Valley) in the northeast portion of the state and Spirit Lake, in the northwest corner. I was hoping these teams would be set up for state final matchup, but they were paired together in the semifinal round. The two times were deadlocked, 14-14 after the first quarter, and Spirit Lake had a tenuous 28-20 halftime lead. Spirit lake scored 2 touchdowns to 1 in the third quarter to lead 42-26 into the final frame. North Fayette Valley, the ThunderHawks, were driving, but couldn’t muster anything. Spirit Lake had the ball, and North Fayette Valley stopped them on fourth down, but was called for roughing the passer. The next play, Spirit Lake ran it in for the touchdown and essentially ended the competitive portion of the game, winning 49-34. The finale was Mount Vernon and Albia. Albia is the Blue Demons, and have an unusual four letters across their nameplates. EMAB. Which stands for, as I found out, “Every Man A Brother.” Mount Vernon, lacking any sort of moniker, won a close one, 24-21. After the game, it was a long drive to Davenport to our already booked hotel. After waking up, we were set to try something new in Iowa: Pizza Ranch. Another Midwest institution, Pizza Ranch was a heavy sponsor of the IHSAA, and after reading about them, my wife and I really wanted to see whether it lived up to its billing. Closing in the mid-afternoon, we couldn’t eat at the one in Cedar Falls on Thursday and hadn’t known about it well enough to pick it on Wednesday night. Down the street from our Davenport hotel, though, was a Pizza Ranch. It’s basically a pizza buffet. That doesn’t sound impressive, but you can request any combination pizza you want for the buffet. And, as many have said, their friend chicken is very good. Of their pizzas, the Buffalo Chicken is the best, with the Sriracha Pepperoni a close second. After that, it was the long drive home while following the Browns-Steelers game online. As I mentioned earlier, Iowa has six classifications. Five 11-man and One 8-man classifications, labeled 4A, 3A, 2A, 1A, A, and 8-Player in descending order. Oddly, I have no explanation for the combined use of 1A and A. The 56 largest schools are in 4A. Followed by the next 56 in 3A, and so forth. The remaining 11-man teams are in A after the other four levels are full. There is no requirement for 8-Player, other than, generally, you can’t have above 120 for your enrollment to play 8-man. But, you can choose whether to be 8- or 11-man below that threshold. In all, the Iowa trip wasn’t that expensive. Parking was $5, which we only paid twice, the program was $5, and tickets were $10 per session ($80 combined, for us). Eating at the stadium on Friday and Saturday was a bit pricy, but the hotels were very cheap for Cedar Falls. Back home, it was a short week in northwest Pennsylvania. With Greenville’s turf field now eligible for hosting playoff games, Sharpsville was set to take on West Middlesex on Friday night. District 10 had a Saturday doubleheader at Sox Harrison Stadium in Edinboro, with the early game Conneaut-Franklin and at 7pm, Cathedral Prep-Oil City. In 2A, Hickory was facing Fairview in Meadville at 1pm while Greenville and Sharon were squaring off in New Wilmington at 7pm. In District 9, a 1A doubleheader was going on in DuBois. With local games available, our choice was obvious. Another trip to Greenville and a chance to see my parents and then a game at Greenville’s Snyder-Stone Stadium. It was my first game attended there that didn’t include Greenville. As I was fairly young when District 10 switched, almost overnight, from allowing grass fields to host playoff games. The game was cold, and not that competitive. A lot of locals were in attendance though based on jackets, hats, and chairbacks or seat cushions. Sharpsville won easily, 46-7. After spending the night at home, it was for the long drive north to Edinboro. Of the two early games, I had figured Conneaut-Franklin to be the more competitive game. After Hickory-Fairview ended 0-0 after the first twelve minutes, I thought I had made a mistake. I didn’t, however. Neither game was particularly close. Conneaut ran away with it, 60-13 and it could’ve been a lot worse. We stopped for Chinese in Meadville on the way south and then to Greyhound Stadium in New Wilmington. We were anticipating rain, but weren’t quite expecting the torrential downpour that happened in the second half. Greenville held a 9-0 halftime lead and looked like they might steal one away. But, Sharon began moving the ball well in the rain and scored and with little time remaining, scored again to take a 15-9 lead and win the game. For the rest of the year, we had planned to keep it simple. Week 14 was going to be a Friday night game followed by four games at Heinz Field. My wife, however, didn’t want to sit in the rain as it was projecting. The matchups, also, weren’t as exciting as the WPIAL has a glut of repeating championship participants. So, we’re headed to Detroit for eight games at the climate-controlled Ford Field on Friday and Saturday. Week 15 will be the three West Virginia championship games at Wheeling Island Stadium. Which will be our last outdoor games on the season. Then we have our ‘big trip’ planned. First a stop in New Orleans for the five public school LHSAA Championships at the Superdome, and then over to Houston for the ten UIL Championships at NRG Stadium the next weekend. It appears that, afterward, we’re going to head to Florida again for Christmas at my wife’s family’s place by the ocean. Which would be a three week vacation. Though, with the prospect of a kid next year, we might as well travel while we can. Who knows. I just know wherever we go, we’ll have fun together.